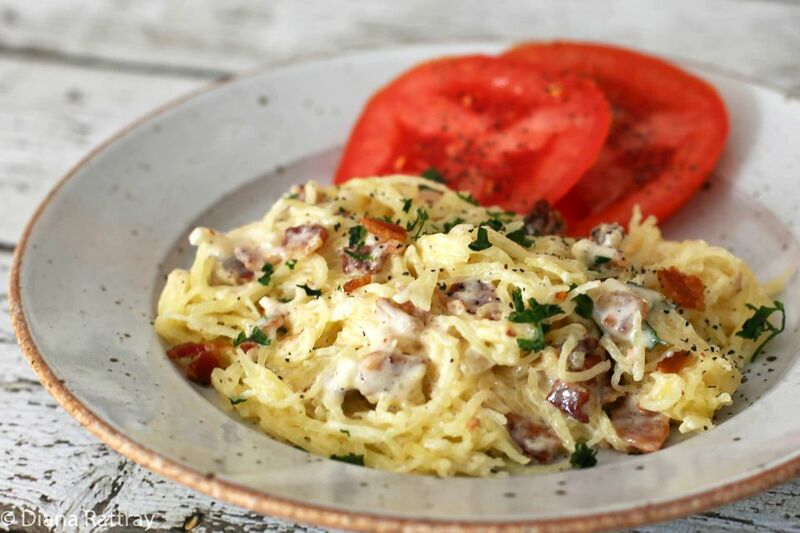 Crumbled bacon and a cream and Parmesan sauce make this spaghetti squash dish incredibly delicious, and the low carb content is especially appealing. Serve this fabulous "spaghetti" dish with a tossed salad or fresh sliced vegetables for a fabulous meal. Heat the oven (or warming drawer) to 200 F to 250 F. This is to keep the squash warm while you finish the sauce. Alternatively, you can just warm it quickly in the microwave when the sauce is ready. Slice off the stem end and blossom end of the spaghetti squash. Cut the squash in half lengthwise and scoop out the seeds. Scrape the inside of the squash with a spoon to remove any soft fibers. Place it in a microwave-safe baking dish, cut side down. Add about an inch of hot water to the baking dish. Microwave the squash, uncovered, for 12 to 15 minutes. The time depends on the size of the squash and the power of the microwave oven. Test it by piercing with a fork. It should be easy to pierce, but not too soft. Scrape the inside of the squash with a fork, transferring the "spaghetti" strands to an oven-safe bowl or container. Cover the bowl with foil and keep the squash warm in the oven or warming drawer. In a deep skillet or saute pan over medium heat, fry the bacon until crisp. Remove to paper towels to drain. Crumble the bacon and set aside. Drain the bacon drippings into a cup or bowl, leaving about 1 tablespoon in the pan. Refrigerate the excess bacon drippings for another use. Add the onions to the pan and saute until just translucent. Add the garlic and continue cooking, stirring, for 2 minutes. Add the cream to the pan and bring to a simmer. Continue cooking for about 4 minutes, until reduced and thickened. Add the Parmesan cheese and cook, stirring, until melted. Set aside a few teaspoons of crumbled bacon and add the rest to the sauce; heat through. If the sauce is too thick, add a little more cream or milk to thin. Gently toss the sauce with the hot spaghetti squash. Garnish the "spaghetti" with a little parsley and more Parmesan cheese and bacon crumbs, if desired. Serve with a side green salad or sliced tomatoes.